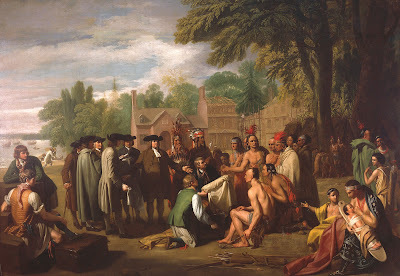 Penn's Treaty with the Indians, Benjamin West, 1771-1772, Pennsylvania Academy of Fine Art via With Art Philadelphia. Benjamin West was a Pennsylvania born artist who specialized in historical scenes. He is perhaps most famous for his "Death of General Wolfe," which I have featured here before. West was a contemporary of General Wolfe, but not of William Penn. In this painting, West relates the famous treaty with the Lenape that was signed shortly after the establishment of the colony of Pennsylvania. West illustrates the scene almost a century after it happened, but the clothing of both the Pennsylvania Quakers surrounding Penn and the sailors that carry their trade goods are apparently unchanged from West's own time. This is not the first time an artist of the eighteenth century depicted sailors of the seventeenth in anachronistic clothing. Today's popular culture often depicts sailors as either pirates or whalers, with an implied idea that those sailors were wearing basically the same slop clothes throughout the centuries with little change. The concept of the rigidly unchanging tar's slop clothes appears to have existed in the past as well. Though this painting depicts a scene from the seventeenth century, it depicts sailors in the clothing of the time it was painted, and so I will be tagging it and including it in my examination of common sailor's clothing of the mid to late eighteenth century. 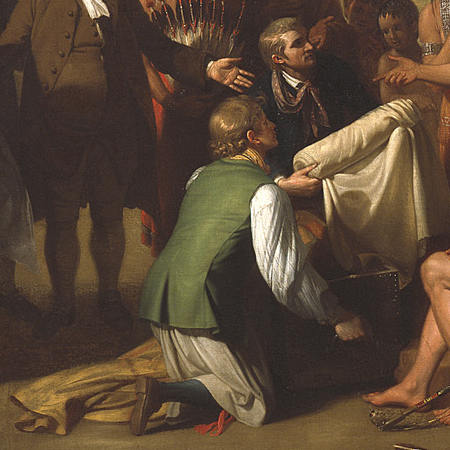 At the center of the piece and kneeling beside Penn, a pair of sailors offer trade goods to Tamanend, a chief of the Turtle Clan of the Lenape. The sailor in the background wears remarkably close cut hair, a white collared shirt, and a purple neckcloth with white spots. He also sports a blue jacket. His mate wears a green waistcoat with a yellow neckcloth and white shirt. His plain petticoat trousers run down to below the knee, and a bright red cloth garter snakes out from beneath the hem. Our sailor's stockings are dark blue, and his shoes are black or brown. 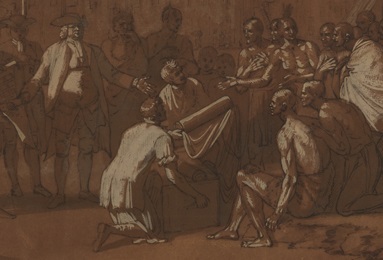 In his compositional study for this painting, Benjamin West original depicted the sailor at center with a longer waistcoat, but shortened it in the final piece. Shortening the waistcoat serves to make it more appropriate to the fashions of the 1770's. This small detail supports the theory that they are depicted in clothes that are more contemporary with West than intended as strictly historical. The first thing that should be addressed is whether these men are sailors at all. Short hair, petticoat trousers, and jackets with mariner's cuffs could certainly suggest that they are. Back when I wrote the piece on West's "Death of General Wolfe," there was some objection that those figures were sailors, as their clothing had some overlap with rangers. These men, however, are clearly shown resting over crates with more being hauled up by their mates from the Delaware River. There can be little doubt that these are indeed sailors. Sitting in the foreground is a sailor showing off something I have never seen before: bare knees and thighs beneath petticoat trousers. There are many, many examples of sailors wearing breeches beneath their petticoat trousers. For quite some time there has been debate on whether or not sailors went without breeches beneath their petticoat trousers, and this painting adds a bit of fuel to the fire. Could it be that this is exceptional? His sleeves are rolled up well above the elbow, and he's taking a break from hauling heavy cargo. Could this be a nod to the historical setting, with West presuming a different fashion for sailors in the seventeenth century? If so, he would probably have made some other changes to their slop clothes. 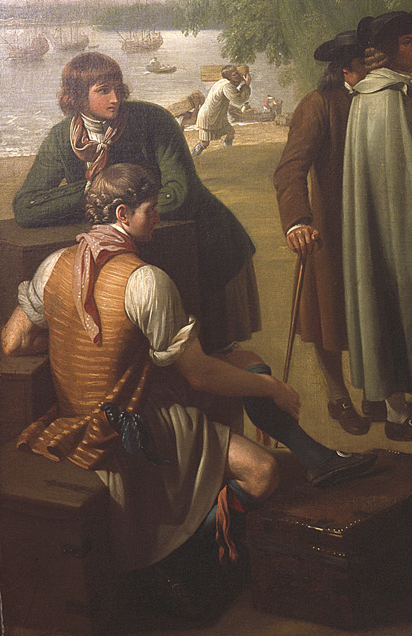 Maybe West was unfamiliar with how sailors dressed and presumed they went without breeches? As a transatlantic traveler and resident of the two largest port cities in the British empire (London and Philadelphia), it seems unlikely that an artist with an eye as trained as West's would miss a basic fact about the physical appearance of sailors. As this is the only image to depict sailors without breeches beneath their petticoat trousers, it would be unwise to draw any conclusions. In any case, like his mates to the right, he wears blue stockings and red garters. His shoes are black with pointed toes and white metal buckles. Out of the slit pocket of our sailor's orange waistcoat with horizontal stripes with a blue handkerchief striped with white. Around his neck is a pink or purple neckcloth, matching that of the man immediately behind him. This sailor wears a green jacket with buttoned downed mariner's cuffs and white metal buttons. He wears a white shirt, blue stockings, plain petticoat trousers, garters, and a neckcloth identical to his mate's. The only other tar we can see clearly is hauling a crate over his left shoulder. His knees are bared as well, showing him without breeches either. Otherwise he wears a smock and dark blue stockings. The Edward Hicks painting "Peaceable Kingdom", in addition to the animals from Isaiah 11:6-8, also depicts William Penn in the background making a treaty with Native Americans.